On Christmas day, people all over the world exchange presents. It is a cultural event full of fun memories. It is also an evolving tradition that loses meaning each year, which is a great reason to go counter-cultural this year? Think about this with me: what if you give the most impressive gift you could give to a friend? Our culture no longer knows the Christo-centric purpose of Christmas. Happy holidays is their new way of talking about the celebration. Of course, their “evolution of the season” does not make it wrong to enjoy the cultural event. Our family participates in many events throughout the year that are not Christo-centric. Ball games, mud runs, and fall festivals are some of the ways we live in God’s world and enjoy the benefits in His world. You can participate in the culture without craving it. A heart governed by God’s Word can interact with the culture’s traditions as a means of reaching those who do not understand Christianity. Perhaps the Lord will provide opportunities for you to introduce someone to Jesus by your activity with them. Paul indeed saw the wisdom in this perspective. There were times when he was willing to set aside his preferences so that he could bless others. Then there is the “but.” I want our children to enjoy our culture’s version of Christmas, but I also want them to experience the real meaning of Christmas more. Understanding the real purpose of Christmas is harder to do for little hearts whose idea of Christmas is wrapped up in presents. Communicating the biblical Christmas is a call to action to present the gospel clearly. Children need to know the birth of Christ is not the complete Christmas story. The Savior’s incarnation is the continuation of a more magnificent narrative that leads to a deeper relationship that God our Father desires for you. Imagine if Jesus showed up as a baby, and that was the extent of His relationship with you. One isolated event on the 25th of December is devoid of the more abundant meaning of the gospel. Christmas without the rest of the story would end up on a large pile of man-centered traditions. A more critical gospel story predates the Christmas season. In Genesis 3:15, long before Christ was born, God gave us a Christmas hint. The prediction of Christmas is why it means so much more than showing up at someone’s home, eating their food, swapping presents, and leaving. You check it off your list. Maybe you breathe a sigh of relief because it is over for another year. That is not the right Christmas. The point is that Christmas is not a singular event disconnected from the rest of your life. Christmas is a continuation of God’s redemptive plan for you. There would be no redemption story without a Christmas story, and there cannot be a Christmas story without a bigger plan. The Son had to be brought into the world, in a particular way, to fulfill the promise of the Father (Genesis 3:15). You were enslaved to sin and sentenced to death. You needed a Savior. Jesus swallowed death with His death. He suffered so you would not have to suffer eternally. The Father’s Christmas gift to you was much more than a baby in a manger. What if your gifts mirrored the gospel story? What if your gifts were part of a more excellent story in someone’s life? Rather than just giving a gift to someone and that is the extent of your relationship with them, what if your gift was a continuation of your ongoing impact in their life? That is what Christmas is to the Christian. Christmas is one piece of a larger puzzle. It is a singular part of the Lord’s ongoing work in your life. It is one gift connected to a more extensive plan that reaches from eternity (past) to eternity (future). You have the opportunity to cooperate with God in something higher than annual gift giving. Baby Jesus was a beautiful gift, but His impact on your life is far higher than a seasonal moment. What if your Christmas gift-giving was part of a bigger story? To understand how you can be used by God to impact another person beyond traditional gift-giving, you have to know the real reason Christ came. Plainly stated, Jesus came to die to set you free. Notice how the Hebrew writer talked about the birth of Christ. So He could be a benefit to others (John 3:16). To help others destroy the works of the devil. So they can benefit from your generosity. The most significant gift you could ever give anyone is the daily death of yourself for their benefit. That is how you mirror the gospel to others. That is at the heart of a theology of gift-giving. Don’t you think that is far better than giving a necktie to someone? Christ was born–He took on flesh and blood (Hebrews 2:14). He had to go through the door of death–a man born to die (John 6:38). The door of death and His subsequent resurrection enabled Him to destroy the works of the devil (1 John 3:8). Once the devil was rendered impotent, He delivered you from your sin (Ephesians 2:1). What does this mean to you? If you set aside your preferences, desires, expectations, and comforts, you will be positioned to help another person to know Christ more effectively (Philippians 2:5-7). Christ set aside who He was and what He had to rescue you (Philippians 2:5-8). This application of the gospel is your calling. 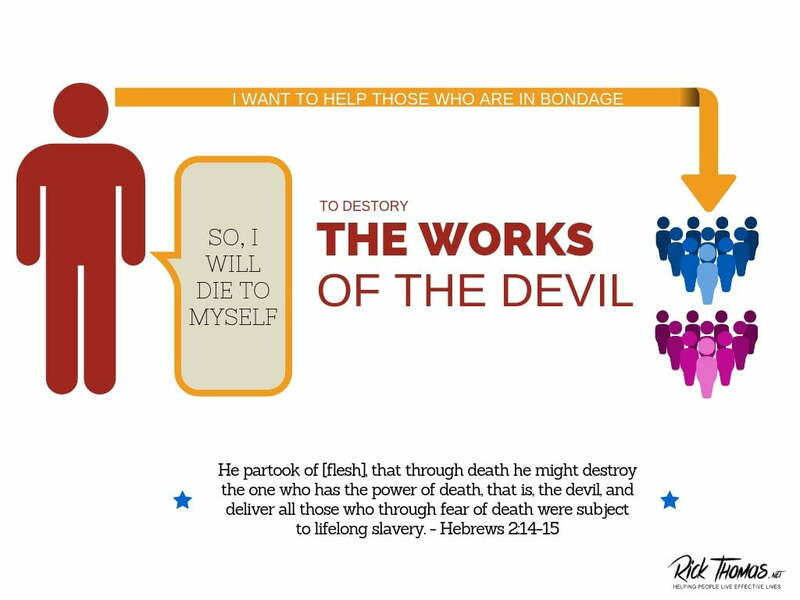 You can cooperate with the Lord to help destroy the works of the devil, the actions that keep people bound to sin. To help a person untangle themselves from sin is the best gift you could ever give. Do you know someone bound by sin? Do you know someone who struggles with a sin temptation? If you want to help them, you will have to be like Christ. You will have to set aside your preferences to serve them. To destroy means to make inoperable. This gospel privilege is your opportunity to search the Spirit to hear (Hebrews 3:7) what He would say as it pertains to cooperating with the Lord to help make inoperable the works of the devil that is active in others. 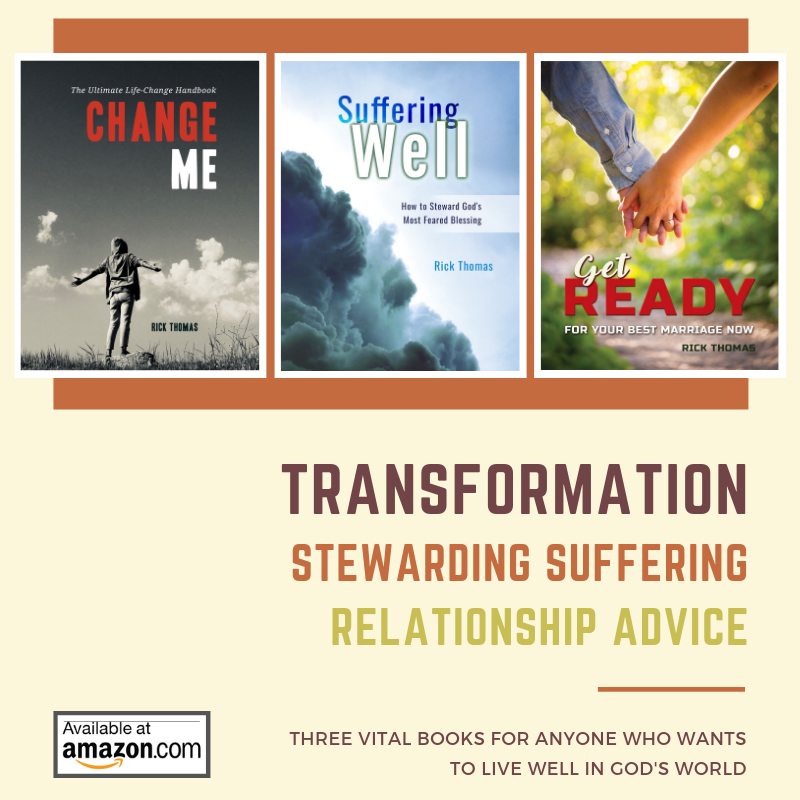 Here are three typical examples of people who need your authentic, gospel-giving sacrifice to help them overcome the destructive works of the devil in their lives. A husband who seeks to satisfy his desires more than he wants to nourish and cherish his wife needs to learn how to walk through death, which would teach him how to love his wife practically (Ephesians 5:29). A wife who struggles to respect her husband because her “marriage dream” is more important than his sin-entanglements will have to walk through death to help him (1 Peter 3:1-2). A son born into a dysfunctional family will have to walk through death by setting aside his longings for a healthy Christian home while being used by God to model the death of the Savior in his home. In all three of these illustrations, the husband, wife, and son will have to make a decision: Do they want to live the life of the Savior in a practical, but a challenging way, or do they want to strive in getting their self-focused desires met? The Savior set aside His desires for your greater good. Your self-sacrifice is a profound gospel application, which challenges you to the core of your practical Christianity. Maybe you could ask yourself this question: What do I need to set aside to help deliver someone from sin? I am sure Jesus preferred an uninterrupted relationship with His Father, but He saw another kind of joy. That joy motivated Him to endure a cruel death for the rescue of a fallen race (Hebrews 12:2). You can’t save people, but you can emulate the gospel as you daily die to yourself (1 Corinthians 15:31). You can practically apply the life of Christ to others by how you set aside your desires for the greater good of those in need. Gospel-motivated gift-giving does not mean you won’t receive the desires of your heart. Setting aside your preferences does not say you have forever relinquished your hopes and dreams. There is coming a day when the Savior will see the full fruit of His hands (Philippians 2:11; Hebrews 12:2; Ephesians 5:27). Setting aside your desires means you can’t get what you want right now, but you are not letting go of your desires. You are putting them off for a season. God will not withhold His lavish love from you. He will always fill the desires of your heart–in His time and in His way. Your point-of-focus must not be on what you want, but what you can give, while trusting the Father to provide what you want, the way He chooses to give those things. My hope for you this Christmas is your gift-giving goes far beyond gift exchanges on Christmas day. May your gospel gift-giving impact lives throughout the year, especially those closest to you, for generations to come. Who is close to you who needs your help? Will you partner with them for the long haul? Will you keep pouring yourself out to them? Will you share with another person your practical response from this article? Will you identify someone you can come alongside to help untangle them from temptation or sin?